Mules are going to Burghley this year!! The British Mule Society team have entered Burghley Horse trials, no, you haven't heard me wrong, there will be four mules going round the cross country course on Sunday. So I if you are there come and say hello. We REALLY are going round the cross country course, but we will be going AROUND the fences as The British Mule society team has entered The Burghley Sponsored Ride on the 4th September 2016. This is a chance to ride along the famous four-star Land Rover Burghley Horse Trails Cross Country Course on the final day of the World Class International Three Day Event. out of a 16 hh Holstiener mother and a 10hh Jack donkey. Jacqui and Clive will be riding two of their four Spanish Andalusian mules, to be decided nearer the date. We are taking this fantastic opportunity to enjoy a 12km leisure ride alongside the huge fences and explore the tracks and pathways of the Burghley Estate while raising money for charity. Thanks to the support of Land Rover Burghley Horse Trials, Burghley Estate, Stamford XT and the sponsorship of SEIB Insurance Brokers, 100% of the money will go to charity. The day includes completion rosettes, a photographer and special Burghley prizes for the most money raised. It's great ride to do with friends, as a yard or club and it is open to riders 5 years and upwards so if anyone wants to join us with their own mule can contact Helen (details on contact page of journal) to find out how to apply. This will be the fourteenth ride held on the Sunday of the Burghley Horse Trials, cumulative proceeds for charities is now over £200,000. 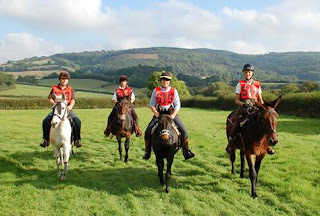 Numbers taking part have varied from 300 – 500 each year and is suitable for horses and MULES of all ages, sizes and abilities to come and take part, provided they are fit and well. The ride allows walking, trotting and some designated cantering areas. There is no jumping. 07895107346 to find out how.